ITS London Limited was established in 1979 and has grown to become one of the UK’s largest independent suppliers of professional power and hand tools, including related products. Due to the expansion of its business, ITS needed to acquire a new main distribution warehouse. They found a 45,000 sq ft warehouse in Loughton, Essex which needed to be re-furbished to make it fit for purpose. They needed to reuse as much of the existing warehouse racking and mezzanine floor equipment as possible so as to minimise costs where possible. Racking infrastructure that could not be re-used would be removed and replaced as necessary. At the start of 2012, ITS sought quotations from their previous supplier – but also asked Acorn Warehouse Solutions to quote for carrying out the refurbishment. ITS had found Acorn’s details on the signage fixed to the racking left by the previous tenants of the warehouse they were about to move into. Acorn was able to provide a competitive price and proposal for the warehouse refurbishment work, and was also able to show how some of the existing racking and mezzanine infrastructure could be re-used in the new configuration. As a result ITS quickly realised that Acorn Warehouse Solutions was a company they could work with, and gained confidence in their ability to deliver on their promises. February 2012 saw the commencement of the refurbishment of the new Loughton warehouse. 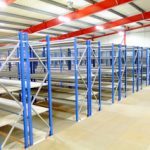 The warehouse solution that Acorn designed for ITS comprised a two-tier shelving system, long span shelving system and mezzanine floors which utilised approximately 50% of the building. 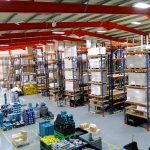 Ten percent of the ground floor area of the building was needed for marshalling and the rest of the premises were fitted with wide aisle pallet racking. The solution was designed to give ITS complete flexibility in its storage for the future. In addition the overall project also involved the removal and scrapping of all of the surplus warehouse equipment, obtaining Building Regulations Approval for the necessary works and liaising with the relevant Authorities in obtaining this approval. With the design skills of Acorn, ITS were able to maximise value by re-using much of the existing warehouse equipment including the mezzanine floors. Acorn delivered a total warehouse refit solution that made maximum use of the available space, as well as setting out the design of a new solution to take ITS forward to its next stage of expansion. Acorn proved helpful and knowledgeable throughout the process. They also understood the issues which are often encountered during warehouse re-fit projects, and worked with ITS to resolve them. 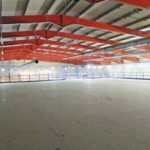 In managing the whole project for ITS, Acorn relieved ITS of the stress that could have arisen from a project of this size and nature, which meant that ITS were ready and able to move into the newly refurbished warehouse on schedule in September 2012. Contact Acorn Warehouse Solutions today to start your warehouse fit-out project.